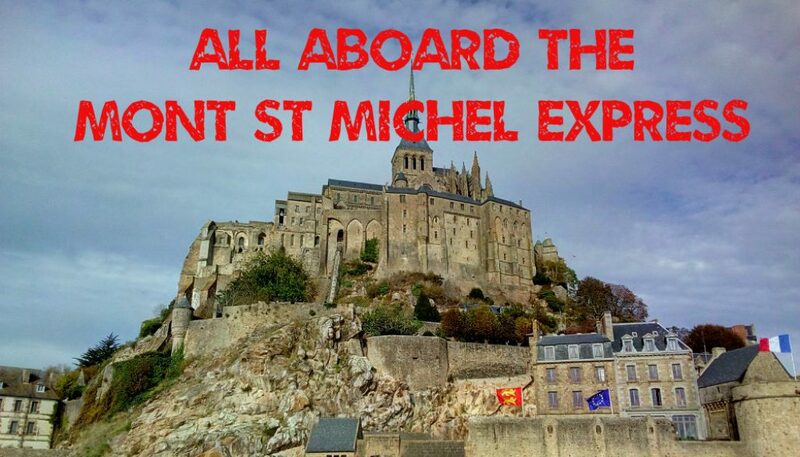 All Aboard The Mont St. Michel Express! When we arrived on our first European trip in December 2016, we left Cherbourg driving towards Rennes. As we drove along the route, we could see the impressive Mont de St Michel sitting just off the coastline. As we were mere rookies then, we had already picked out our place to stay in Rennes and felt more secure driving from one overnight stop to the next. When we saw the Mont, Michelle cried out “turn down so we can visit!”. That didn’t feature in my insecure driving radar as it was my first day driving in France, so with a down-turned face she just took in the view as we sailed past. It was obvious therefore that it would feature high in our priority list to visit this year. We picked out 2 possible stop over points. As the weather was still considerably cold, we wanted electricity to be able to plug in our oil filled radiators. There was a motorhome aire about 2.km from the visitor centre, and also a campsite about 200m closer. The motorhome aire was priced at €15.50 per night and with our ACSI card the campsite worked out at €17. We opted on the campsite to allow us to get a decent shower and catch up with some laundry. We chose the campsite Aux Pommiers in Beauvoir. Here the staff were very friendly and spoke perfect English although I had to speak a tiny bit of French when she didn’t understand my Northern Ireland accent! I had to quickly think back 38 years to my GCE French! The campsite is very neat and well kept. The facilities were very clean and the luxury of a hot shower was great, without switching the water on and off, as we do in the van to save water. The laundry on the other hand was expensive €5.30 for a wash and €3.30 for the dryer. The problem was that when the dryer had finished its cycle, the clothes were nowhere near dry so we had to buy another token making the total almost €12. Fresh after a good night’s sleep with heat in the van, we started to make our way to Mont St Michel. Just across the road from the campsite is a wide foot / cycle path which runs alongside the river towards the visitor centre about 2.5km away. As the sun was shining and the daytime quite mild, we decided to walk along the flat footpath. After about 30 minutes walk you arrive at the huge car parking area and visitor centre. There is also a motorhome park here if you want to drive your motorhome straight to Mont St Michel. From here there is a free shuttle bus to take you across the new bridge to the Mont which saves about another 2.5km walk. The shuttle buses can be driven from either end. They arrive at the car park bus stop which is a dead end. The driver gets out and walks to the other end of the bus where he can then drive it to Mont St Michel without the need for turning the bus around. Without any orderly queueing system there is a bit of a scrum to get on a bus. We decided to hold back as the bus filled and then stood at the position where the bus door would be to await the next one. They run about every 5 minutes and we were first on the next bus! The small rocky outcrop island is surrounded by sand flats at low tide but as the tide comes in water surrounds the island once more. This made it a very strong fortress both with the defences of the tide and the amazing views from miles around would allow its inhabitants to spot any approaching attackers well in advance. Because of these defences it was also once used as a prison. There was once a causeway which allowed access by pilgrims to the abbey at low tide, but a new bridge has now been built, completed in 2015, which allows the hoardes of tourists who visit the Mont daily access 24/7. When you exit the bus at the foot of the Mont, the scale of the abbey towering above is awesome. An abbey has existed on the island since the 4th century and below it lies many original houses inside the fortified town walls. You enter the fortifications over an old drawbridge and through an archway with a portcullis. Once you enter though, this is when the mood changes. Inside exists commercialism on a grand scale. Every accessible building up through the main street and even around the ramparts is either a hotel, restaurant, cafe bar or tat souvenir shop, with additional food stalls thrown in for good measure. We saw one of these selling small bottles of Coca Cola priced at €4.80! Battling your way through thousands of tourists on the narrow street further up towards the abbey, many buildings house tacky paid for “museums”. As you approach the abbey itself after quite a climb, the entrance fee is €10 each. I don’t agree with paying extortionate entrance fees to see inside religious buildings, but this didn’t stop thousands of people entering…. what a money spinner! The number of tourists here on the last day in October is mind blowing and I hate to think what it would be like in the summer. I thought I might climb the steep steps for a sneak peek inside – but as we approached the top of the steps there was a security checkpoint with walk through metal detectors and a searcher. So here is a free view of the inside knave (with thanks to Jorge Láscar at www.flickr.com). What was once the defender is now the defended. How sad this place must now feel to true pilgrims. We decided to try and escape the crowds by exploring the smaller streets and alleyways. We discovered a small church which was free to enter. Inside was a statue of St Michel, the slayer of dragons, in front of beautifully carved wooden panels. Just round from the church was the small cemetery, neatly laid out and adorned with beautiful chrysanthemums. Traditionally the French dress graves with these flowers on All Souls Day, 1st November. Many of the buildings inside Mont St Michel are beautiful with medieval wooden structures, but even the olde worlde signs outside the shops and restaurants don’t disguise the real modern day purpose of the whole place as a massive commercial venture. On leaving the Mont to catch the bus back across the new bridge it was time for a last few pictures. The whole place certainly looks impressive and when viewed from a distance against a blue sky it is picture postcard beautiful. It is almost as if someone has placed an ornament on the horizon, (and many such ornaments are available for purchase in the numerous tat shops). That said, we did leave feeling rather deflated at the whole experience. This feeling wasn’t helped by the increasing crowd waiting (notice I did not use the word ‘queueing!’) for the free shuttle bus back across the causeway. After 2 buses we neared the edge of the kerb, but the crowds continued to develop into a deep melee on the wide pavement. So I made the journey back to the main car park alone, but luckily the next bus arrived with Michelle on board just a couple of minutes later. We made our way back along the canal towpath to the campsite, but couldn’t resist a few more looks back over our shoulder at the ‘ornament’ on the horizon. Mont St Michel fire brigade!